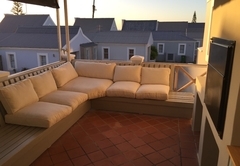 KiteSky is a property providing self catering in Langebaan for up to 6 guests visiting the Cape West Coast region. 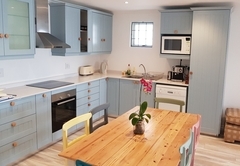 Situated on the Langebaan main beach, KiteSky is part of the famous and popular Smartie Town. 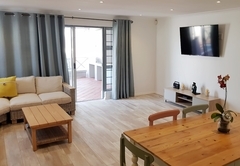 Being close to the beach and within walking distance of central Langebaan, this house is ideally suited for beach and water loving guests. 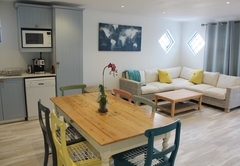 The house can accommodate six guests is three bedrooms. 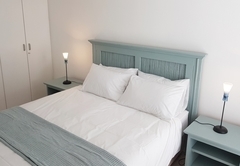 The main bedroom is furnished with a Queen-size bed and has an en-suite bathroom. 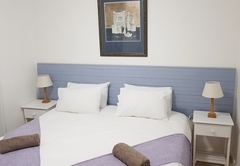 The second bedroom has a King-size bed and the third room has two single beds. 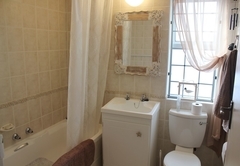 There is a separate guest bathroom for the second and third rooms. Bed linen and towels are provided. 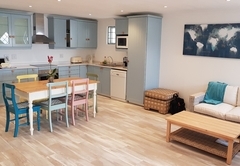 There is a comfortably furnished open plan living area which is comprised of a seating area, dining table and fully equipped kitchen with a dishwasher. 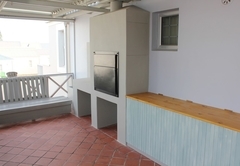 The area, which has wooden floors, opens to the sheltered patio with built in braai facilities. 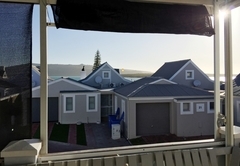 KiteSky is located on Langebaan main beach and is part of the famous and popular "Smartie Town". 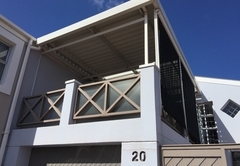 Newly renovated with all the necessities. Linen and towels provided. Response timeKiteSky typically responds to requests in 5-10 minutes.